A vegetation fire at a San Luis Obispo homeless encampment threatened the KSBY television studio Sunday afternoon. 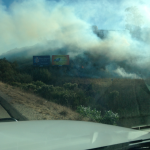 The fire broke out around 4:30 p.m. at a camp between Calle Joaquin Road and southbound Highway 101. Gusting 10 to 15 miles per-hour winds spread the fire across 1.5 acres. San Luis Obispo city firefighters and Cal Fire responded and controlled the blaze within 30 minutes. The television studio did not suffer any damage. Fire investigator Gene Hicks said the fire was caused by an abandoned warming or cooking fire that rekindled and sparked dry vegetation. The San Luis Obispo Fire Department responded with three fire engines. Cal Fire brought four.